Take certified CompTIA training to better understand common hardware and software technologies that support complex IT infrastructures. 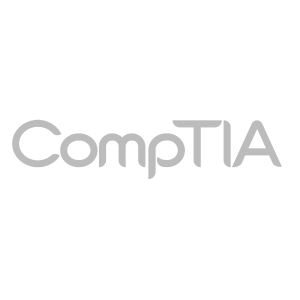 Acting as the leading name in global IT industries, CompTIA is a standard for all technology workers to base their knowledge off of. With our enhanced CompTIA coursework – which has earned the highest status possible, the CompTIA Authorized Quality Curriculum (CAQC) – you will be empowered in your position. From fulfilling requirements to understanding the finer points of IT matters at large, you will put yourself into a far better position upon completion of our enhanced learning program. This will be delivered by qualified professionals, while all content is CompTIA approved and modular for easy customization per your corporate certification requirements. A full selection of intermediate through advanced courses and certifications are available, while plenty of hands-on exercises will give you real-world skill, enough to pass any exam. Don’t get behind the eight ball in your IT department – get rolling with our CompTIA training courses today!